LunaRising ArtGlass offers a full service stained glass and fused glass studio. You'll be able to work directly with the owner, Michelle, to have the glass work you want, the way you want it! We also offer repair services. If you have broken stained glass in need of repair, email us to inquire about repair services. Stained glass installed in your home will increase your home's value while adding beauty that is unmistakably you. Whether you are planning on building your own home, remodeling, or just adding new accents to your living space, we will be happy to help you realize your vision. Giving the gift of glass can make a big impression and leave your loved one feeling very special. Shop in the LunaRising Etsy Store to see what is available for immediate purchase. If you don't see what you want there, just email us and we'll be happy to make what you want! 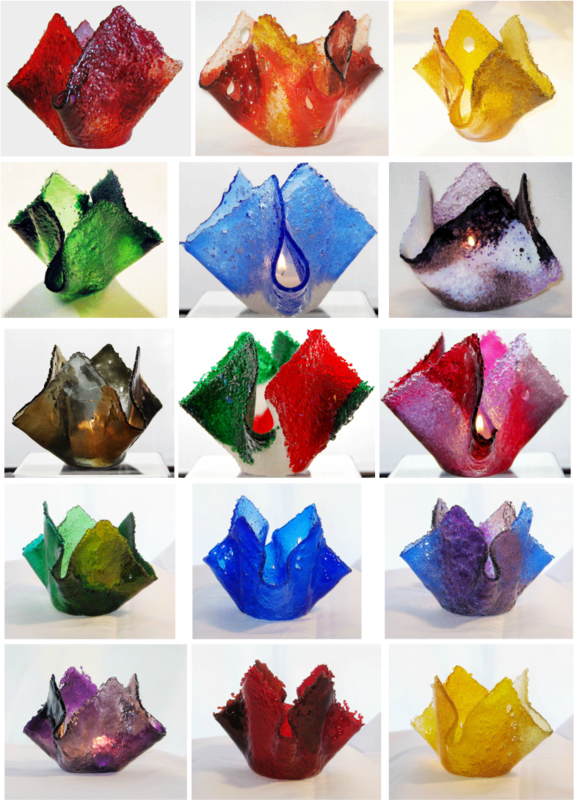 My Signature Fused Glass Candle Holders. They can be made in just about any color! 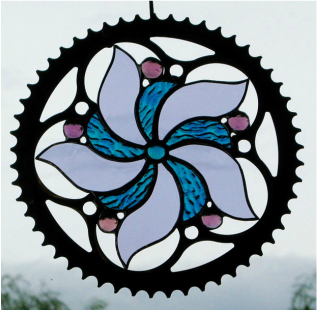 Stained glass flower in a bike sprocket.